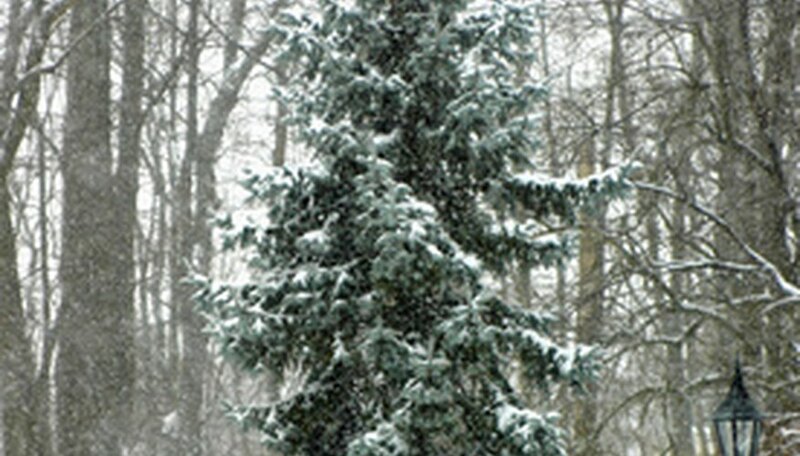 The blue spruce (Picea pungens) holds little value has a timber tree due to its brittle wood and numerous knots but it is a popular landscape or Christmas tree. It offers a unique bluish-green evergreen color and a perfect symmetrical shape. The tree attains a height of a 115 feet with an average lifespan of 800 years. The tree is self-pollinating. Seed production does not begin in a blue spruce until the tree is 20 years old. Fertility will persist until the tree reaches 150 years old and then begin to decline. The blue spruce is self-pollinating and considered to be monoecious which means that it is both male and female. The tree is easily capable of pollinating and fertilizing itself with each. Each spring the tree produces flowers known as strobili in both male and female sexes. Pollination will follow in the mid to late spring. The male strobili appear on the upper portion of the tree but can also be densely located lower. The flowers are appear bright red in whorls on the vegetative growth of the tree. Rarely the male flowers also appear to be a yellowish-green in color. According to the U.S. National Forest Service, one male strobili on a blue spruce contains 370,000 pollen grains. The female strobili flowers appear on the upper portion of the tree near the male strobili. The flowers are located on the lateral areas of the branches in a terminal position. The flowers emerge a yellowish-green in appearance but quickly turn bright red. Each female strobili offers 175 to 225 scales which easily produce 350 to 450 seeds after pollination occurs. Depending on the elevation that the tree is located at the pollination occurs between May to June. Higher elevations occur later in then season then lower elevations due to the extended winter time conditions that often persist. Two weeks after the female strobili reach maturity they begin to turn their scales at a 45 degree angle to horizontal in anticipation of pollination. Over the next two to three weeks the cones fully open for the pollen reception. At four weeks the cones are at their maximum size and fertility. The blue spruce produces abundant cones for fertilization and seed production every three to four years. Pollination occurs from the wind predominately and insect activity. The cones reach full seed maturity in August. From August into the winter months the seeds are mature and wind dispersed.